Red Lily Vineyards Wedding Inspiration. Springtime in Oregon is something to behold and this styled shoot from Red Lily Vineyards provides fresh wedding inspiration. The long wait through the rainy months in the Pacific Northwest is worth it to witness the beginning of spring through such a soft and delicate design. The color palette consists of gray, white and green and it’s first presented through the invitation suite. The presentation is minimalist and crisp to reveal the wedding’s simple style. Springtime blooms are curated for the bridal bouquet to give it a light and airy appearance. An assortment of florals like pink roses, black and white anemones, and silver dollar eucalyptus make for an interesting, texture-filled arrangement. The bride dons two looks in the shoot and the first is a classic wedding gown, complete with a fingertip-length veil. As she stands on a rock next to the Applegate River, one can see the pleated hem of her gown and the long flowing gray ribbons on her bouquet. On a stone patio next to the river, a reception space is created with an ornate wooden table and beaming white high-back chairs. For softness, the tablescape features a white fabric runner, a floral centerpiece that echoes the look of the bouquet, and tall white taper candles. Place settings include a most graceful thin place card, white china set, white napkin, and gold flatware. For this outdoor experience, the bride’s hair is braided in a voluminous single braid with soft tendrils that frame her face. As she sits at the head of the table, one can also see the back detail of her gown and the beautiful pink ribbon tied in the back. To continue the refreshing springtime theme, the two-tier wedding cake features an all-white appearance. 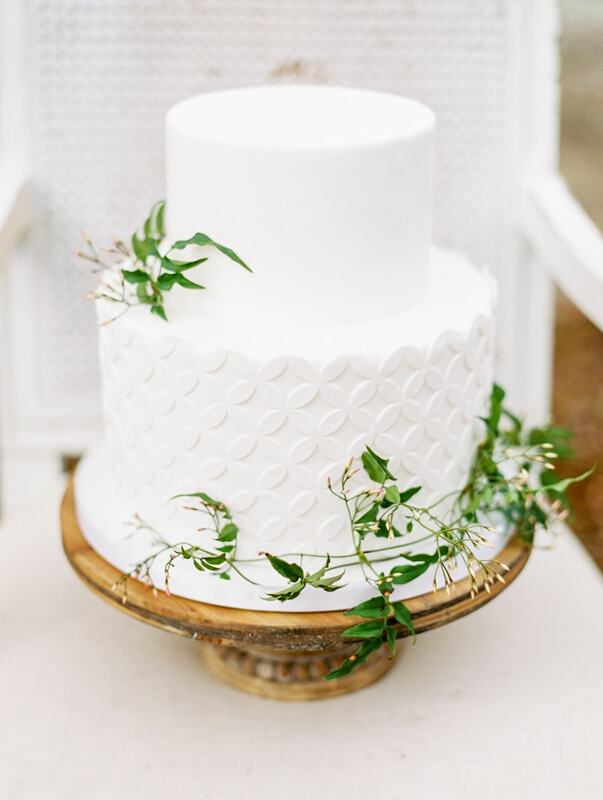 A modern fondant design covers the bottom while the top is clean and crisp. The cake is embellished with small sprigs of greenery that tie in the color palette and ambiance. Now it’s time to relax and celebrate. The bride changes into a floral full-length gown with a sweetheart neckline. It features a beautiful overlay and tied ribbon waistband. The colors in her bouquet and dress are complementary to the budding trees and grass and the blue appearance of the mountains in the distance. The white overlay of her gown is the perfect accessory to play with as she journeys through the woods. With no veil, her braid is on full display and her makeup looks light, yet dramatic. She presses her toes into the sand on the riverbanks and enjoys the scene of the rushing water. All the while, the magic of spring continues as she looks forward to the season of new beginnings.